I didn’t know much about this film until a friend of mine expressed to everybody on his social media feed that a relatively unknown film had come to England’s cinemas from Taiwan called ‘Serbuan maut’ (The Raid: Redemption). He claimed it to be one of the greatest action films he had seen. Because I’m a fan of foreign films, and I don’t mind subtitles, I wished to see it (as I have previously seen some great foreign action films such as ‘Ong Bak’ (Tony Jaa) and ‘Oldboy’ (Choi Min-Sik)). The film was directed by Welshman ‘Gareth Evans’ from Hirwaun, now living in Indonesia. After doing a documentary about martial art style ‘pencak silat’, he met The Raid’s lead actor ‘Iko Uwais’. Uwais was working as a deliveryman for a phone company before being ‘discovered’ by Evans who made him the star of the movie ‘Merantau’, which when released in 2009 became a cult hit. The premise to this film is blindingly simple. A SWAT team is sent out to bring down a drug kingpin who is holed up in a thirty floor apartment block. The main character ‘Rama’ (played by Iko Uwais) is an expectant father and part of the 20-man SWAT team led by Sergeant Jaka and Lieutenant Wahyu. 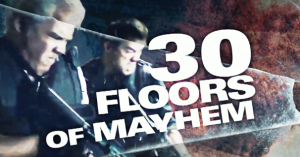 After making it inside the building, the team begin to climb the floors making good, quiet progress throughout the floors, non-violently taking down suspected criminals on the way. This doesn’t last long (these things never do). A young child steps out and sees the team making their way down a corridor and springs the alarm before being killed. The block goes into lockdown and every occupant indebted to the drug lord are now hunting down the team. After this moment, we see some of the greatest hand-to-hand combat since Jaa himself. Now, as with most action films, the storyline in and of itself is lacking – but it stays within the realm of the possible, and it’s shot in such a way that it has a claustrophobic feel to it, which merely adds to the overall feeling of the film. If you are a martial-arts film lover, then you owe it to yourself to go and see this film. And a lot of credit must go to the director Gareth Evans, who is not only the director, but the main writer for this action packed film. Word has it that Evans and Iko are already working on a third movie, tentatively titled as ‘Berandal’ (Thugs), which is said to be a sequel to this film. 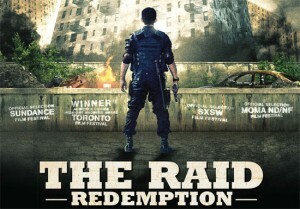 It looks likely to be called ‘The Raid: Retaliation’ for the American market, and due to the original films success, will be granted a significantly larger budget. Filming is marked for January 2013, and includes around 100 days of physical production.